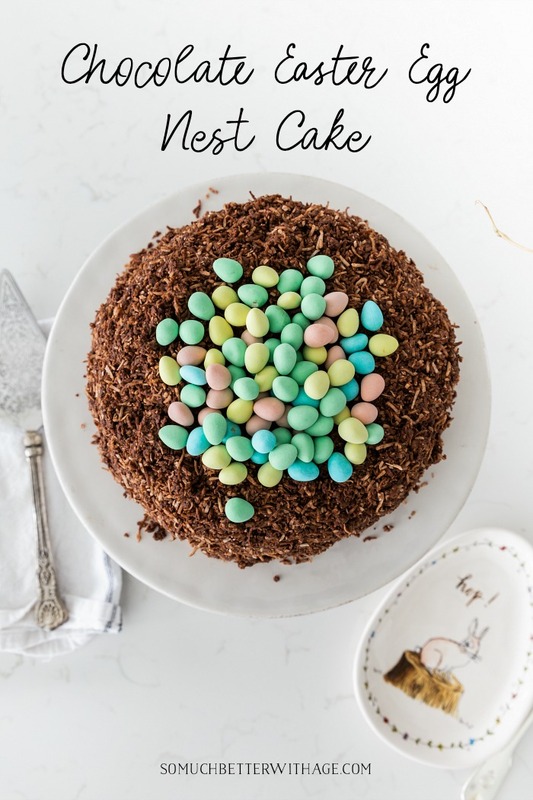 This chocolate Easter egg nest cake is so delicious and easy to make. 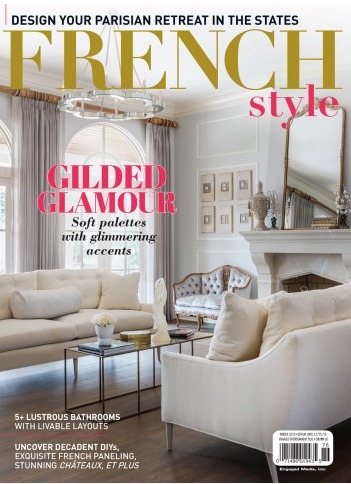 It’s sure to wow your family and friends this Easter! 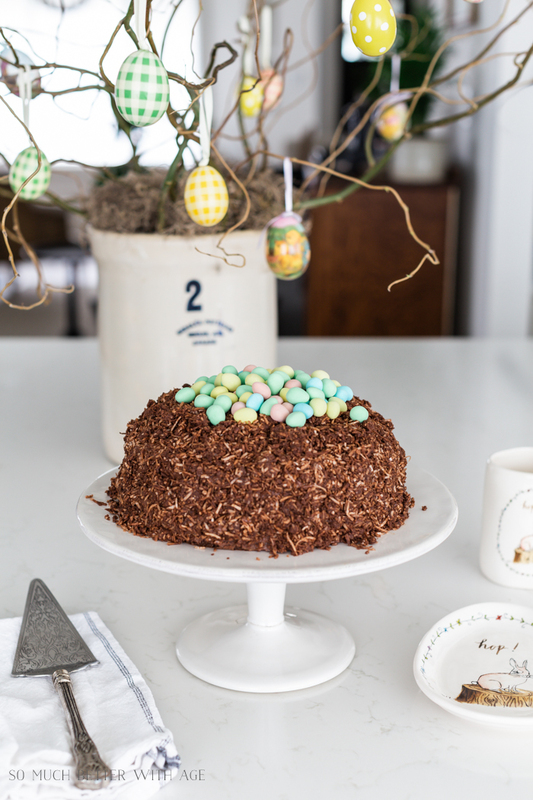 This chocolate Easter egg nest cake was so fun to make and surprisingly easy. 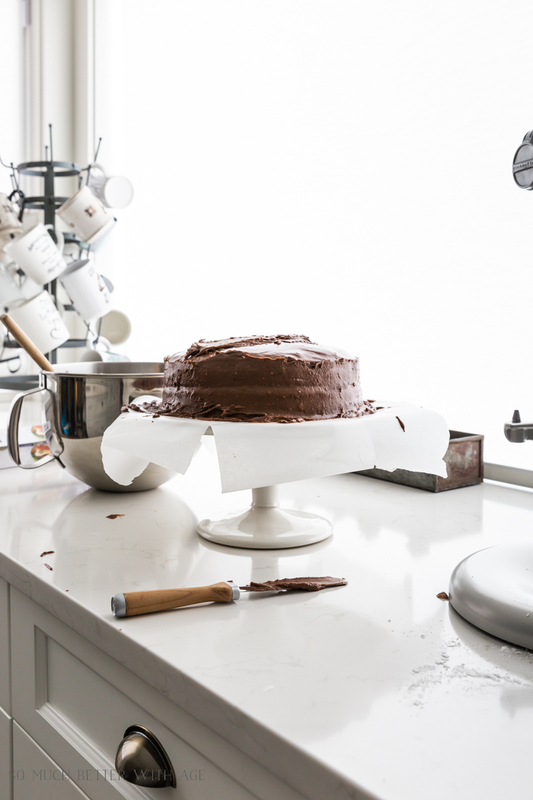 I’m also using making it from the best ever chocolate cake recipe that I haven’t shared with you yet. Let me show you to make it! 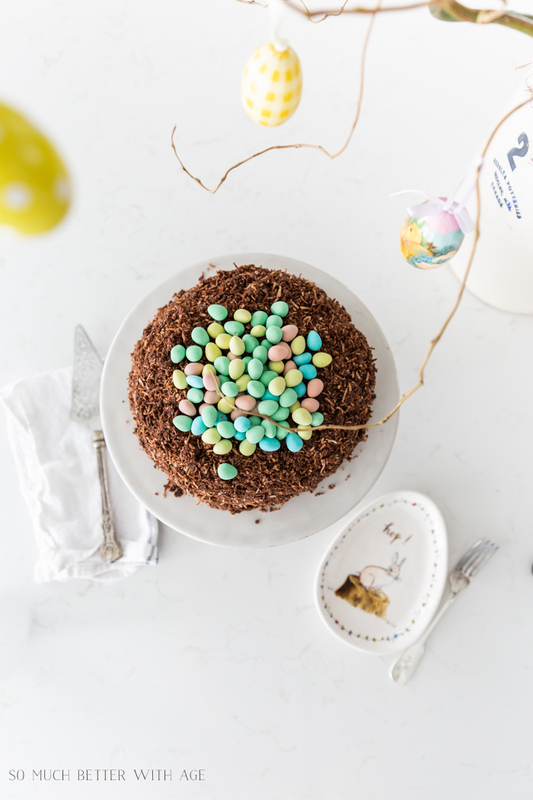 Once you make the chocolate cake using the recipe below, make the icing and add wax paper or parchment paper just under the edges of the cake to avoid getting the plate messy. 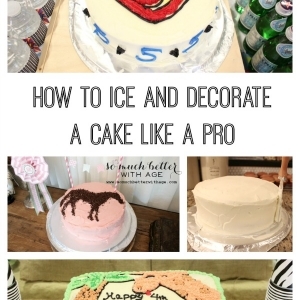 Ice the cake without worrying about doing a crumb coat beforehand. The cake will be covered with the ‘nest’ so you don’t have to worry about it looking pretty at this point. Then put it in the fridge for the cake and icing to firm up a bit. 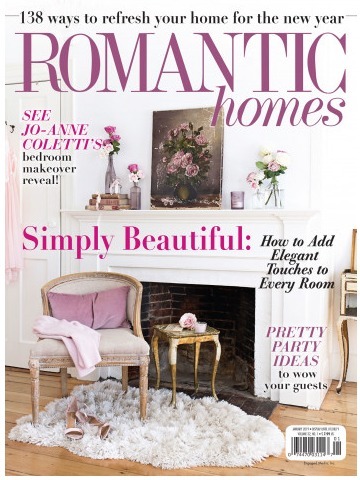 With the cake in the refrigerator, it’s time to make the nest. 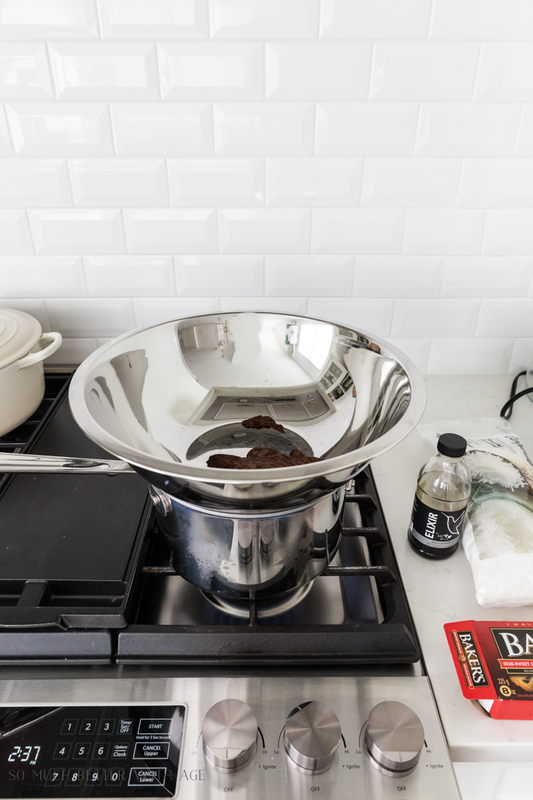 Melt a box of semi-sweet chocolate squares over a double boiler. I don’t have a double boiler set so I bring a large pot of water to a boil and add a metal mixing bowl on top. You want the chocolate to melt (with the butter) then remove it quickly so it doesn’t become hard. Then add the vanilla and add one cup of coconut at a time to the chocolate mixing it in with your hands to incorporate it all in. Then take a clump of the coconut mix and push it gently onto the cake, all around the edges and the top to make the nest. Finish it off with a pile of Cadbury mini eggs to the top! It not only looks great it tastes amazing too! 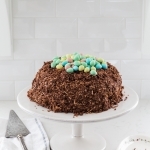 I’m sure you’re family will love this chocolate Easter egg nest cake. 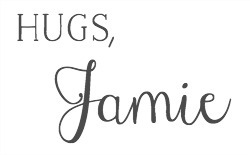 Print the recipe and enjoy! This is the BEST chocolate cake and I've made an Easter egg nest out of it. Preheat oven at 350 deg F and grease and flour 2 circular cake pans. 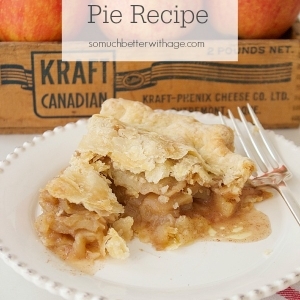 Put all dry ingredients in a large bowl and mix together in a mixer or with a hand mixer. Beat in milk, oil, eggs and vanilla on medium speed until well combined. Reduce speed and carefully add milk and boiling water until well combined. Distribute cake batter evenly between two prepared cake pans. Bake for 30-35 minutes, until toothpick comes out clean in centre of the chocolate cake. 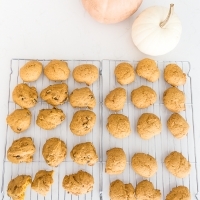 Remove from the oven and allow to cool in for about 10 minutes then transfer from pans onto cooling racks. 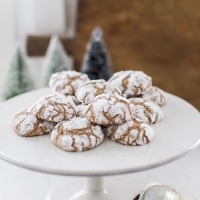 Put icing (powdered) sugar and cocoa in a bowl and whisk together to remove any lumps. Cream butter in a mixer or with a hand mixer and slowly add half of the sugar and cocoa. Add the vanilla and some of the milk and mix well. If it gets thick, add a bit more milk. If it gets too runny, add more icing sugar. 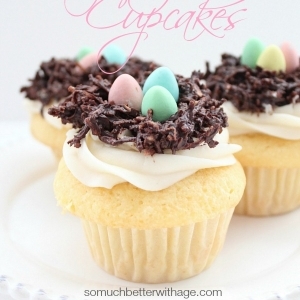 The ingredient amounts for the icing is approximate so you can add more or else depending on the consistency. You want the icing to be a bit firm but not too runny or too thick. 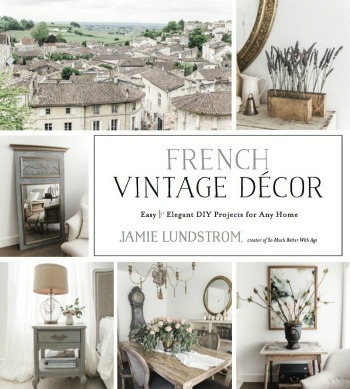 Ice the cake and put in the fridge while you make the nest. Melt one box of unsweetened chocolate baking squares in a double boiler with the butter. Once melted, remove from heat add the vanilla. Add coconut one cup at a time working quickly to work in the coconut to the chocolate before it hardens. 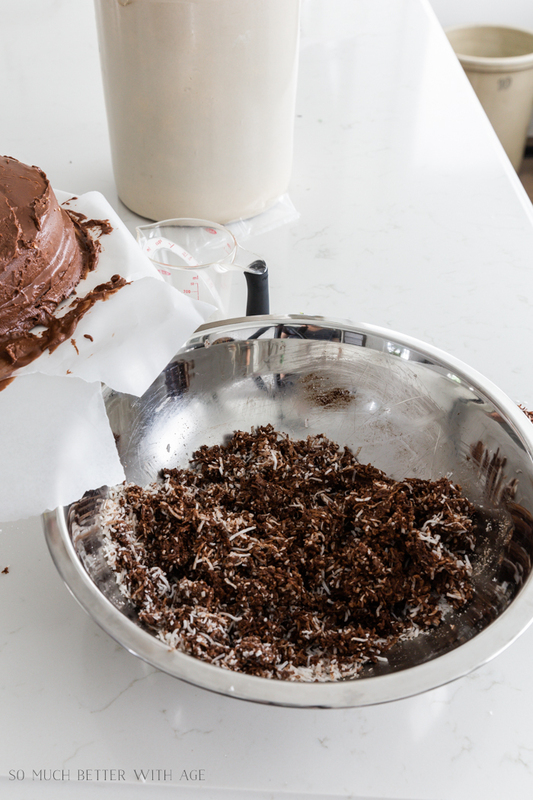 You may need to use your hands to incorporate all the coconut into the chocolate. 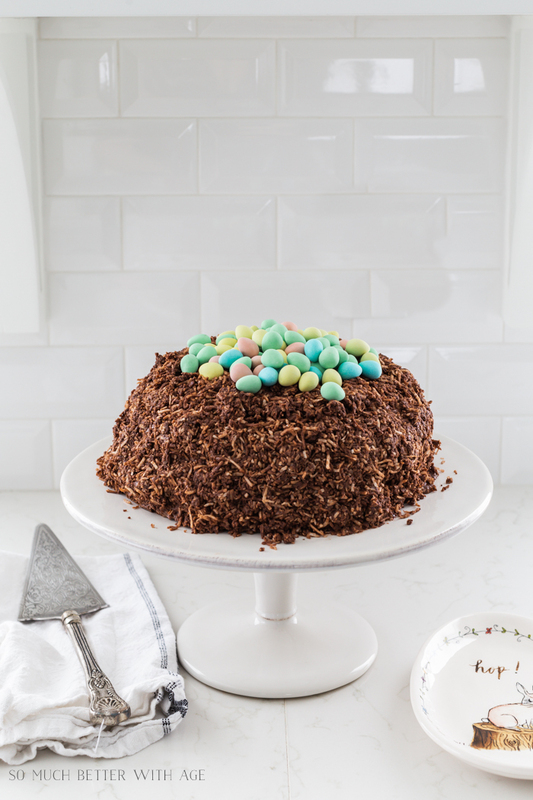 Using your hands, add clumps of the 'nest' around the edges and top of the cake gently pushing into the cake. Add a pile of Cadbury mini eggs to the top.